How Much Do Colorado Springs Dental Implants Cost? Dental implants have quickly become the most preferred solution to treat tooth loss because they are predictable and effective. Offering over a 95% success rate, more than 500,000 dental implants are placed each year. While they are effective, many are hesitant to choose them due to the cost. Although dental implants do cost more upfront than traditional forms of tooth replacement, like dentures, they allow you to make an investment in your dental health. If you are looking for Colorado Springs dental implants, Rocky Mountain Periodontal Specialists can help. On average, dental implants can range in price from $1,000 to $3,000. However, this is a very rough estimate. There are several factors that influence the price you will pay. For example, if any additional procedures are needed beforehand, like tooth extractions or bone grafting, the price will increase. In some cases, your dental benefits may cover a portion of these costs to help make the procedure more affordable. To receive dental implants, it involves a multi-phased treatment process, which also influences the cost. You will need to see a periodontist for the first phase of treatment. A periodontist is needed to surgically insert the titanium posts into the jawbone. This requires a great deal of precision to ensure the procedure is successful. Since a specialist is required, the price will increase. We provide dental implants for accurate and successful implant placement. After your jawbone has healed, the second phase of treatment involves attaching abutments to the implant posts. Next to the implant posts, this is the second most costly step of the procedure. The implant specialist will place the abutments to allow the dentist to create your custom-made restorations. The final phase of treatment involves adding the custom-made restorations to the abutments. You will need to visit your dentist for this phase of treatment. Your dentist will have their own separate costs for the procedure. In some cases, they may offer financing options to help make it more affordable. Why Should I Pay for Dental Implants? Many are hesitant to choose dental implants when there are more affordable options, like partial dentures. However, in the long run, traditional options will cost more than dental implants. Dental implants last a lifetime while improving your oral health. You will pay more upfront, but you will not need to have adjustments or new prosthetics made in the future. In addition, you will preserve your dental health to keep dental costs to a minimum as time goes on. You will also see a savings on dental products. You will not require special cleaners or adhesives like those needed with dentures. 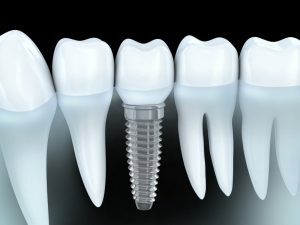 If you are ready to make a true investment in your dental health, it is time to contact Rocky Mountain Periodontal Specialists for dental implants in Colorado Springs. We offer high-quality care to ensure the success of your procedure. To make dental implants more affordable, we offer many payment options, like CareCredit, to help you restore your smile. Comments Off on How Much Do Colorado Springs Dental Implants Cost?